In the heart of upper Bergamo and facing one of the nicest architectural monuments in town, S. Francesco cloister, still protected from the noise of the main street. Two minutes away from the funicular and the enchanting Piazza Vecchia, it is in a strategic position to reach the places of historical and architectural interest such as the Teatro Sociale, Piazza Vecchia and the Palazzo della Ragione, and St. Augustin church , to name but a few. You will be lodged in a mansion house dating back to the XIV and XVI centuries. Walking through a marvellous old original wooden gate, you will gain access to the privacy of an interior courtyard with a portico, a central well, a wrought iron balcony and a blown glass door. The palace has belonged for generations to one family that take pains and devote resources to the upkeep of the building. A marvellous stately stairway of stone and wrought iron, ceiling fresco, period furniture, a beam ceilings and an unparalleled view over S. Vigilio Hill. The bathroom, as well as the whole flat, has just been restored. Shower. Practicle, fucntional, white, big Ikea kitchen. It's a flat in the heart of the Upper City though away from the noises of the main street. It is a historical houses, quiete and elegant. There is beautiful inner courtyard, a Renaissance 'portale' and a central well which will enchante our guests. What a magical place this is, it would be far too easy to rush past this pearl of a place and go directly to Milan. We almost did that and would have missed out on a great weekend experience. Yes we were blessed with fantastic weather but even it had been an overcast weekend the upper town of Bergamo would still shine. Easy of finding the apartment, correspondence, meeting the owner and even the owners son were all excellent, could not have been a better experience. I really do feel that whatever your interest is Citta Alta has it all, from breathtaking buildings (when you step inside some of the churches they really do take your breathe away), locally sourced food and wines served in excellent restaurants to cater for all budgets to unique transport links! It does have it all. We will certainly be back and for a longer stay this time. The apartment has a fantastic location and has everything that you should need. The outside space is a bonus as I guess not many old buildings can offer such, if I was being really picky it was disappointing that you could not see the entire magical views when seated outside. But no real hardship and I can understand due to the physical nature of the building why it is so. This certainly did not impinge on our enjoyment of the apartment nor the town, they were both fantastic, they complimented each other. Although I should not really be telling anyone about this as would rather keep it ourselves!!!!! Thanks Andrew for the beautiful comment! First visit for us to Bergamo. Rainy and foggy, but it didn’t matter. This place is amazing. And we would never want to stay anywhere else. Alessandra’s apartment is more than perfect. Beautiful, charming, comfortable and the best location. Fabulous views, spacious, everything you could want. We made one dinner at “home” so we could enjoy the apartment as much as possible. Alessandra and her son Alberto are so gracious, hospitable, and went out of their way to make our all too brief stay perfect. Very nearby restaurants were delicious and delightful. Grazie mille!!! This was our 3rd time in Bergamo - we love the town, especially citra alta. The highlights of this apartment are the location, views from the rooftop deck, and helpful owner. The apartment itself is simple, but was all that we needed for our 3 nights. Note that the apartment is on the 3rd floor with no lift, and the rooftop deck is up a small, steep flight of stairs. No problem for us, but those with mobility issues may be challenged. Also, the bed is very firm/hard. Not the most comfortable, but ok for a couple nights. Overall, we really enjoyed our stay! The apartment is very beautiful. There are a lot of space and a fine roof terrace with a view on Bergamo's many towers. Alessandra was a charming and helpful hostess. We could not expect anything better. I have stayed in this flat before and chose to return because I loved the house and the town so much the first time. Arriving by the funicular (which is handily close by) feels like entering a different world. The owner is cheerful and helpful, and the flat is within a beautiful grand palazzo and yet has all the comforts of a homely place. It is great to be on the top floor overlooking the town and the hills beyond, and on what feels like a level with all the bells which sound morning and night. Bergamo offers so much, from art and history to beautiful landscape which is easily accessible by foot from town. Cobbled paths go all over the hillside and there is a wonderful outdoor bar on Via Virgilio with views for miles. There are some excellent places to eat - avoiding some of those right in the centre - but best of all we enjoyed eating in the flat which has a memorable little roof terrace. Should you want to, the bus and train services are a useful way to venture further afield though we have always found plenty to do in Bergamo itself and have been loathe to leave it. It is a special place. 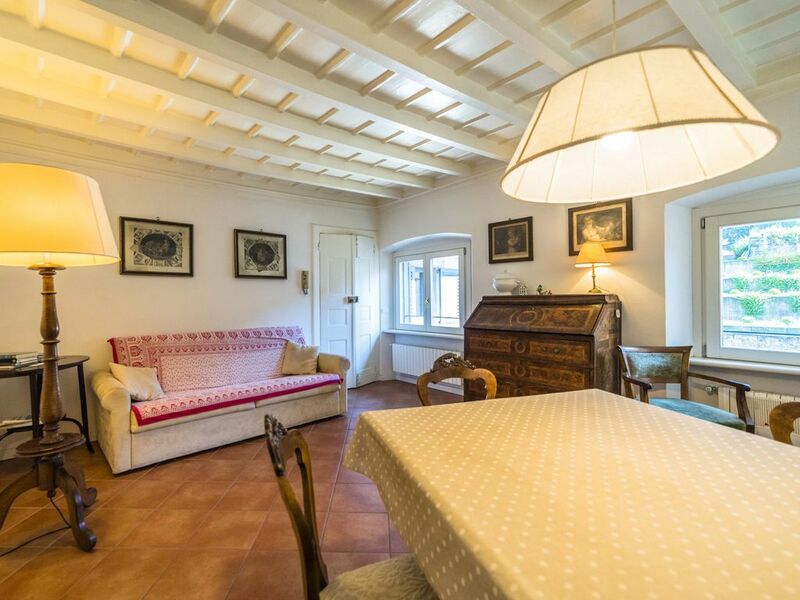 Comfortable, historic, well-equipped apartment in Citta Alta. Bergamo is a lovely city and there is no better way to experience Citta Alta then staying in once was an 18th century palazzo up a quiet street very near to the funicular that takes you to Citta Bassa. The apartment is on the 2nd floor - no lift - and has a large living room, kitchen with just about anything you need including a washer. The bedroom is large with plenty of closet space & drawers. The bathroom is fine. The owner, Alessandra, is very helpful and lives in the same building. Do note that their is no air conditioning, however, there is a lovely cross breeze from the windows. Also note that Bergamo churches love to ring their bells. And at 10PM every evening the bells ring 100 times - a centuries old tradition. We stayed three nights and decided at the last moment to take the 45 minute bus ride to Lake Iseo and we were glad we did. Don't miss the Accademia Carrara gallery art museum. Note that the taxi from the train station is Euro 10 and if you have luggage you don't want to have to deal with a bus to the funicular then the two block walk up a river rock road! Bergamo is a fabulous city and this property is an excellent choice to feel like a local! The province of Bergamo will amaze you for its variety. Renowned for Città Alta – the Upper City – one of Lombardy's most fascinating locations, it is rich with history and culture, all the while surrounded by the Bergamo Alps, gentle hills and crystalline lakes. The Upper City is an enchanting medieval town, enclosed in intact 16th century Venetian walls, all cradled within the refreshingly green setting of the Park of the Hills. On foot you will discover not only magnificent monuments, but quaint cobblestone lanes winding past centuries-old houses. The ancient city spreads out into characteristic burgs in the lower and dynamic city with its smart shops, museums and the Donizetti theatre. Lake Iseo, of glacial origin, is one of Lombardy's most beautiful lakes where you will find Europe's largest lake island. The lake teems with trout and pike, while its shores produce a superb olive oil.